If you are wont to watching music videos, especially those from times gone by, I am sure you will agree that watching Roberta Flack performing her hit entitled "The first time ever I saw your face" is a profound experience. Pure and unforgettable. Something to savour in the privacy of your own company. It simply resonates perfectly with the essence of the species. Which is how it should be with most first times, come to think of it. And listening to Roberta, it seems every first time leads to another - a fusion-like reaction encompassing one's total being. The boy had come to shake me up at just after four. It was bitterly cold, and first light promised to be something to remember. He had around his neck my leather belt, with the Cudeman in its sheath. At his side was his own knife riding comfortably on his belt. And the binoculars hung under his left arm, ready for instant use. He had a backpack on, and he had brought my boots. He had also brought a cup of coffee and a rusk. I would not be able to raise any excuse, even if I wanted to. The boy would not be denied, so I rose and got dressed. In the murky darkness I took the Ruger from its bag, and I gave him five cartridges and the rifle. My rifle. Which I do not share with anyone. It was checked the previous afternoon and the boy performed well at 150 meters. 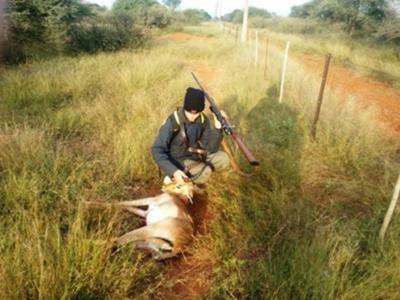 That was the anticipated range for our hunt along the four kilometer passage cleared on either side of the fence. I had on many occasions observed impala there. They could be successfully stalked, but it was also possible that you would have to take a longer shot. We walked quietly, stopping every so often to listen. I asked him to set the pace and the direction. Usually I lead, setting my pace. Not today. I could see his posture change. He walked upright, carrying the rifle with confidence. His demeanor spoke of purpose. I was inordinately proud of him. The Impala were in the rut, and the rams had been at it all night. We could hear several territorial rams warning off competitors. When we reached the huge termite mound we veered off to the north, at right angles to the passage and the fence. At one point we encountered increasingly thick thorn. The krokodêrs had infiltrated further that I had anticipated. The going became tough, but he kept going. At last the bush opened up, revealing the passage to our front, just like we had planned. We stood perfectly still, listening. The vapour from our lungs created white ghostlike beards around our faces. I briefly thought this was nature's way of validating the changing relationship between us. We of the beard. I quietly indicated to him that we should sit down. He selected a spot against an ancient witgat (Shephard's tree). So began our vigil. Just after first light we heard the wire fence jingling, and we knew that the first Impala had arrived. The boy took the binoculars and carefully approached the fence. He crept up to a lone katbos, from where he could observe the passage to the left and right without being seen. He could scarcely conceal his excitement when he came back. He had seen several impala and a huge ram, which had horns "like a Lechwe". We worked out the distance to the Impala, and estimated them to be about half a kilometer away. I told him to set a course which would bring us about 150 meters from them. He silently nodded and began his approach. We walked quietly, stopping often. I could sense his plan. He would fall back from the fence and then strike out west, after which he would go north again, hopefully emerging close enough to the impala for a chance at a shot. I was surprised to see that he kept a steady line, and we made slow but useful progress. During one of our stops he gave me the water bottle. I accepted it gratefully. We did not speak of my eternal thirst. He was as much in tune with the needs of his fellow hunter as he was with this bush. clear I crawled up to the brush, next to him. Very carefully he scanned to our left. His smile gave it all away. I got into position and as I put the glasses up, the impala jumped into focus. The ewes stood next to the fence while the territorial ram was leaping to and fro over the fence, desperate for some undecided ewes to join him. Clearly he had other things on his mind. He was totally unaware of us, barely 150 meters away. The ewes were bundled up, not offering a clear target. The ram was out of bounds, not because of any instruction by me, but because the boy had said so. I was impressed. The boy indicated with his eyes and I saw a young knyphoring (young ram) standing apart from the ewes some distance off. He was walking directly away from us, becoming obscured by scrub. Presently hitherto unseen ewes emerged from the trees and crowded around him, making a clean shot impossible. I whispered to the boy to get into a shooting position, reasoning that the young ram would possibly put some distance between himself and the territorial ram, and would then stop. The bush behind which we sat offered nothing by way of dead rest. Standing up would be disaster. He beckoned me forward and put the rifle over the small of my back. Now I am no more a proponent of a place-kicker making use of a team mate to keep a rugby-ball upright than I am of someone making use of me as a dead rest. But somehow I just did it. And lying there I thought about the pictures of Erik Engelbrecht and Eunia Barnard which appeared in Magnum some years before. A sharp poke in my ribs brought my mirth to an end. "How many?" I whispered. "Three and a half poles" he replied. "That makes it about 250 meters" I said. "Go for a high shoulder shot" I continued. "Ja, op die knoppe" he said, and then the muzzle blast kicked dust in my face. I distinctly heard the strike, and I restrained him when he wanted to jump up. "I have marked the spot" he said. "Fine", I said, "Now wait a few minutes". It must have seemed like an eternity to him. It surely did to me. Eventually we set off. The impala had all disappeared into the thick stuff. When we came up to his mark, I showed him the impact-tracks, and a little further the first blood on the earth. The first blood he had spilled. Then he saw the ram, standing in some brush, alert but clearly in trouble. With the binoculars I quickly saw that I had underestimated the range. The bullet had dropped a little further than expected, and had been placed a tad to the right. The breastbone was shattered and some lung tissue protruded. I looked at the boy. He was steady. Then he took a dead rest and put a round in the neck, just below the ears. When he had dragged the ram to a suitable place, I showed him how to remove the intestines. For a first time he did rather well, I thought. Now he appreciated the extra water I had insisted on. Having washed our hands, I helped him carry the ram towards the road. Then I sent him for the bakkie, which I actually do not let other people use. He walked tall. He was no longer a boy. He had completed the rights of passage. He was now a hunter. And a man. He had taken his first buck. The correct way. The only way. And the entire experience was filled with first times. Most profoundly for me. Memories that would last till the end of time. An umbilical cord that would connect us around the many campfires that will mark his passage through this life, and the few that remain for me. "And the moon and the stars were the gifts you gave, to the dark and endless skies" - the tune mulled through my mind as I lay in my bed, feeling sorry for my aching feet. It was bitterly cold, and all around me the others were already asleep. Just before I surrendered to Morpheus I thought about the dynamics contained in making an authentic first time possible for someone else. A gift from the heart, intended to drive away darkness. And I realized that within the gift of a first time, there will of consequence be first time moments for oneself. But perhaps more profound was the realization that should one fail in fueling the synergy so created, that first time might very well be the last time. Filled with a mixture of melancholy and a deep sense of satisfaction, I drifted off to sleep. My last thoughts were of the fine young man Douw had become. Roberta Flack's First Take album was one of the best ever cut on Vinyl; I especially liked Angelejo Negros or Black Angel; but the First Time definately goes with your wonderfully written story of passing the Hunting Tradition on to young people. Great Story, Willem!